Earn up to 13,410 reward points. Handcrafted drums to elevate your drumming performance. No detail has been overlooked. No corners cut. Its look and sound are custom-inspired. Its value difficult to match. To its makers, the Performance Series exemplifies what it means to be handcrafted by DW. 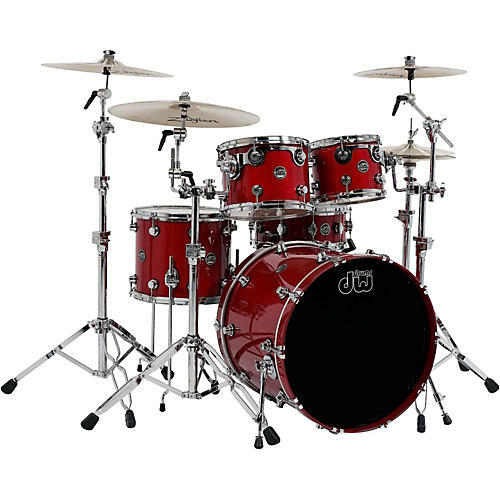 In addition to advanced HVX shell technology devised and constructed by John Good and the DW Custom Shop team in in the USA at their Oxnard, California shop, this Performance Series 5-piece kit is fitted with quarter turret lugs, low mass die-cast claw hooks, and finished in a gorgeous pewter sparkle framed by chrome hardware. Tom(s): 10" x 8", 12" x 9"
Floor tom(s): 16" x 14"
The original custom-inspired drums. Order today!